Amplify the current facility aesthetics with 'Industrial Chic' 4', 6' and 8' backless park benches from the Madison Collection. 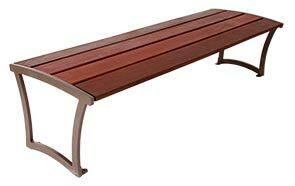 Trendy and versatile, featuring tropical Ipe hardwood and a contemporary design solid steel frame, these premium wood benches perform well in an array of applications. Built ready for long-lasting performance and engineered for continued exposure to seasonal elements, the all-steel frames are sealed with a high-quality, UV stabilized, corrosion resistant powder-coated finish. Innovative footings allow for both portable and surface mount installation capabilities. Options available with side armrests to raise the comfort level.